Installing FreePBX 13 on CentOS 6 - FreePBX OpenSource Project - Documentation for your Wiki! While commercial modules can be installed on CentOS 6, THERE IS NO GUARANTEE THEY WILL FUNCTION AS EXPECTED OR AT ALL. If you are looking to use commercial modules it is highly recommended to use the FreePBX Distro. You MUST run all of these commands as the root user! You must disable the default iptables. You can re-enable it later, once you have made the appropriate changes. Information on iptables can be found with a quick Google search. If iptables is left running, it will (at very least) block you from accessing the web interface. If you don't have any physical hardware you don't need to run these commands, however, it is still suggested to compile the modules, to allow you to add hardware later. You will be prompted at the point to pick which modules to build. Most of them will be enabled, but if you want to have MP3 support, you need to manually turn on 'format_mp3' on the first page. Note that this installs the (8khz) 'wav' soundfiles and G722 (High Definition 'Wideband') audio. If you wish to use Commercial Modules you will need to perform the additional steps below. Once I ran that I was able get it to stop running. Yes, I was going to update with that information but hadn't had the time. I have updated to reflect this. I am trying to do the same on Google Cloud Engine, however all my calls have no audio any suggestions? Check your NAT settings on the extensions. Under Advanced make sure the NAT mode is Yes. That might fix it for you. OMG! so simple, that worked!! Got through the entire install on my Google Cloud VM install. Was able to get to web interface, but when I set the administrator name and password I was getting the following error: "file_put_contents(/var/log/asterisk/freepbx_security.log): failed to open stream: Permission denied"
If this command was missed I would double check the /var/lib/asterisk and /var/spool/asterisk directories as well. I must have missed that step. I thought I had done it, but I guess not. Maybe adding the run folder to the instructions would help? That is literally the first step in the Set Ownership Permissions section. Geez. I ran that step, too. You can delete my comment. I don't know why that permission is getting reset. I'll move my issue over to the forum. autoconf and automake are required dependencies for the jansson thing. Updated to include Development Tools in case the minimal install doesn't install them. You may want to add this to the list of modules required. Other than that, these steps worked great! I followed the steps but get the Apache test page when I try to access it with my browser. If you are getting the Apache test page than a step was missed. The FreePBX web files are installed during it's install process but you need to make sure all the directory permission/ownership is correct. If the ownership or permissions are incorrect the files will not write. Sorry, i'm new at this. Where should I check or at what point should I go back to and star again from? I would check /var/www to verify nothing is there. I would do an ls -la /var/www and check it's ownership to make sure it's Asterisk. Make sure that the Set Ownership Permissions and the Small changes to Apache steps are followed. Where there any errors outputted during the install process? Asterisk was not installed properly. Either not compiled properly or it's user permission/ownership is incorrect. Are you not just copying and pasting the commands? Better yet, can RackSpace due a custom ISO? I would suggest using the ISO to install. Rackspace can't do a custom ISO. I did cut and paste. I would recommend vultr.com then, they allow custom ISOs. I do not know what is happening here, these instructions are proven and work. You are not following them in some manner and this is the cause of the errors. I can't see how I can mess up a cut and paste job...lol I carefully went through each step. I used CentOS 6 PVHM the first time and now tried with 6 PV. Shawn, the Wiki comments are not for troubleshooting problems. If you are still having an issue with this you can join #freepbx on FreeNode via IRC or the community forums. Possibly someone can recommend a hosting site on par with Rack Space where I can just use an ISO. I am looking to set this up for a client. I just recommended http://vultr.com to you in a previous comment. They allow you to upload your own ISO. Make sure that php-posix is installed on the server. sweet! that did it, thanks all! 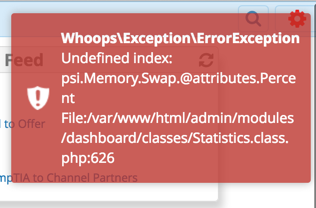 This error is pretty self explanatory. Asterisk is running as the wrong user. Did you do the permission changes? Did you run ./start_asterisk as the instructions states before running ./install -n? yes sir, and I just re-ran them just in case I missed one.. still same error. Then make sure Asterisk is started and running as root. Because that's what's happening. If it is then do this from the server cli: asterisk -rx "core stop now"
Then run ./start_asterisk and ./install -n from the FreePBX directory. ...when trying to enable the Endpoint Manager module. Any ideas? When you do a manual install you have to do manual setup for additional things you want to do on the system. EPM requires a /tftpboot directory, which needs to be owned by the asterisk user. Thanks for the reply, will the following do it? Any ideas what I should have entered? And that worked for me...I think. Might need the -R to make the permissions recurssive? Kevin R I am also installing on Google Cloud - I only get one way audio, did you run into that problem? Any suggestions or pit falls you learned with GCE? Thanks!!! I've used these steps many times and they are very helpful! Thanks! I've noticed that flite, the Text-to-Speech engine is missing after these steps. It's referenced in the FreePBX Settings/Text to Speech Engines menu, but it doesn't actually exist in /usr/bin/flite. If you could please include the steps to have it installed, I'd appreciate it! 2016-12-14 16:01:37 ERROR 404: Not Found. You need to install php-digium_register-3.0.5-1_centos6.i686.rpm for this to work. Just as it told you. This is a manual install, additional modules and service such as this are installed as you need them. i have already installed this rpm by "yum install php-digium_register"